We are are working with other churches locally to set up and run a food bank to serve the communities of Mill End and Maple Cross. You can find out more on our own new website here. The Food Bank will have it’s base in Berry Lane Methodist Church. The church have given space to store and operate from, which is great news, and it is their way of supporting this venture. To make this vision live though we now need you! We don’t need lots of your time, or even especially special skills but we do need people like you to be willing to stand outside local supermarkets and collect from local shoppers by asking them to buy 1 thing on a list that you will give them, to meet and greet those who come to the bank either in Mill End or Maple Cross, to help sort food by date, and other practical jobs. In Mill End, the bank will open on Tuesday afternoons. Having canvassed opinion at St Thomas’, the hope is run a branch of the Food Bank out of St Thomas’ church, probably on a Monday afternoon both branches from 2.00-4.00pm. We are slowly building up a list of stakeholders who will refer clients in using the voucher scheme - the CAB & Three Rivers’ housing are interested. If we also include our churches & the Chiltern's centre & health visitors then we have a start to see where we go. 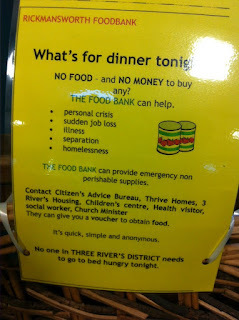 If you are willing to help at either branch on either day, or willing to collect food as and when we need it, please can you make contact with us over on the contacts page of this site. We need you, but we also need your continued prayer for this incredibly important adventure seeing the love of God impact our communities in very practical ways.